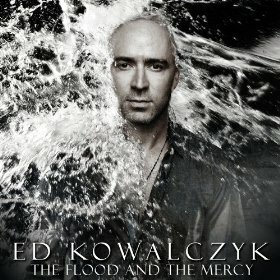 Ed Kowalczyk’s new solo album, The Flood and the Mercy, is his second since his departure from the rock group Live. It manages to carry the torch still for introspective lyrics, layered electric guitars, arena-sized emotion and blaring drums and bass against moving rock-based pop rhythms and melodies. Kowalczyk’s lyrical daring is often a man-in-the-mirror kind of gaze, seemingly struggling to become a more refined and honest man, someone more spiritually alive and whole. His desire to evolve is sandwiched between a comfortable pop rock assist, no doubt due to the help of R.E.M.’s Peter Buck. “Seven” and “Angels on A Razor” each begin with stripped-down guitars and Ed’s signature vocals that remain perfect for rounding out a bigger rock push with heart. “Solar Flare” and “Rise” emerge with more mainstream commercial rock success. Navigating the waves of philosophy and spirituality against the backdrop of amplified musicality, The Flood and the Mercy still sails. It also offers a sturdy 21 songs, including Elder Jeepson’s dubstep remix of “Rise” and electrifying vocals by reggae artist Hawkman.